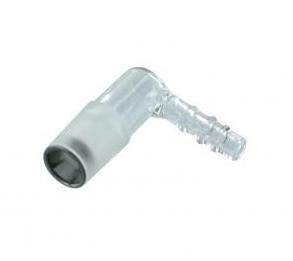 The Extreme Q Glass Elbow Adapter is used to either attach to the 3" Mini Whip to fill vapor bags or to attach to the whip and then connect to the Cyclone Bowl on your Arizer Extreme Q 4.0 Vaporizer. The Glass Elbow Adapter can also be combined with the 3" Mini Whip to make your Extreme Q compatible with a water tool as explained in our Extreme Q Tips and Tricks. The glass elbow is made of a thick cut glass, making breaking it not as easy as you might think.